Our Pick of the Week this week is All Around Town, a charming game that explores stores in the neighborhood while developing sorting, thinking and classifying skills. As you move around the game board, you’ll visit the grocery store, furniture store, book store, clothing store, pet store, and art supplies store. Race around town to collect a card from every store and match them to your game mat. In addition to developing logic skills, players will also sharpen their social skills and awareness of community locations. The shops in this town are just like the ones you and your child have visited in your neighborhood. 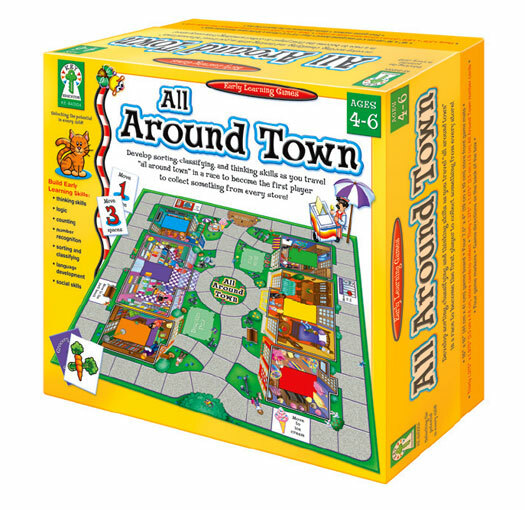 This week only, SAVE 15% on the “All Around Town” game by entering in the promotional code BLOGAAT2 at checkout! This set includes a game board, 4 game mats, 60 game cards, and 4 markers. With the “All Around Town” game, players will be able to improve critical thinking and strategic planning skills as they race to be the first player with a card from all six stores in town. *This offer is valid until August 6th, 2013 at 11:59 pm EST. Not compatible with any other offer. Be sure there are no spaces in the promo code at check out! Written by: Different Roads to Learning on July 30, 2013. This entry was posted in autism, autistic spectrum disorder, Behavior, Daily Living Skills, Development, Pick of the Week, Playskills, Products, Social Skills by Different Roads to Learning. Bookmark the permalink.